WHICH PAN TYPE AM I? WHAT PAN FITS ME? HOW MANY PANS NEEDS MAN? This is very individual. 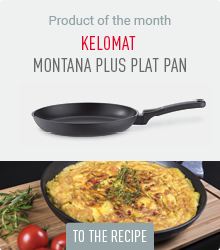 As a rule of thumb, one can say: A coated pan for gentle heat with anti-fatigue effect for low-fat cooking, an uncoated universal pan – also suitable for sharp frying of meat – in one or two sizes (depending on the size to be cooked) and possibly one Special pans for omelets, pancakes, crepes & co, Asian dishes or fish form a good basic equipment. There is hardly a border to the top. Pans are so diverse in material, size and shape as there are dishes and occasions for cooking. 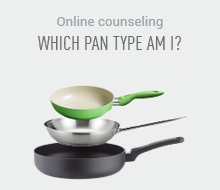 As an aid to the right selection, we have set up an online consultation to choose the right pan (s) for your purpose. Just click the button “Consultation” below and off we go.